Marissa Farrar: Autumn's Blood, Out Now! Read First Chapter Here! Autumn's Blood, Out Now! Read First Chapter Here! 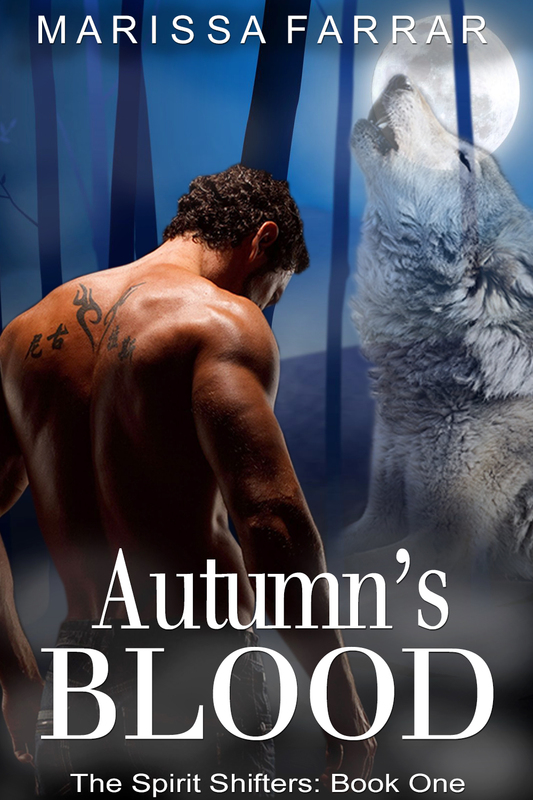 After months of work and much enjoyment on my part, I'm excited to let you know about the release of my new novel, 'Autumn's Blood', which is the first book in my brand new shifter series, 'The Spirit Shifters'! The novel is currently available on Amazon, Barnes & Noble, Apple, Smashwords, Kobo and AllRomanceebooks for only $2.99! Book One: Autumn's Blood, out now! Sound interesting? Keep reading for a sneak preview of the first chapter! BLAKE WOLFCOLLAR FOLDED his arms across his massive chest and bit down on the fury tearing through him. He needed to keep control of his emotions. Now more than ever. Losing his grip on himself would mean exposing his true identity to the people who wanted to control his kind. Bulletproof glass separated a team of men-which included him-from the three people held captive. Further sheets of glass divided the prisoners, deliberately done in order for the detainees to be able to witness each other's torment. In each of the glass cubicles, a solitary metal chair was bolted to the floor. The prisoners-a woman in her mid-thirties, a man of about the same age, and a boy in his teens-had each been handcuffed to the chairs. To any outsider, the people could have been a young family, but Blake knew they'd never laid eyes upon each other until they'd been brought to the facility. The government building towered above their heads, but they weren't being held above the city. This part of the compound was buried several stories beneath ground level, preventing anyone who shouldn't be there overhearing what was going on. His superior, and friend, Peter Haverly, glanced over his shoulder to where Blake stood, his back to the two-inch-thick metal door which led to the elevator providing access to the rest of the building. Haverly's eyes widened at him briefly, accompanied by a slow shake of his head. Blake pressed his lips together and glanced away. He understood what Haverly was telling him-don't get involved, stay quiet for the good of their kind-but he wasn't known for his self-control. Maxim Dumas, a silver-haired head of Operation Pursuit, pressed a button located on the control panel in front of him. He leaned forward and spoke into a small microphone. "We know what each of you is. If you simply change for us now, we won't have the need to use force." A growl threatened to rumble from Blake's throat, but he managed to swallow it down. The blunt ellipses of his nails dug into the intricate tribal tattoo etched into the bulk of his bicep. He forced himself to loosen his grip and ran a big palm over his head, his dark hair buzzed military short. He had no way of telling Dumas that the man, woman, and boy were unable to change at will without blowing his cover. Most spirit shifters only fused with their spirit guides in moments of intense stress, pain, or emotions. Of course, what Dumas planned on doing would take these people to such a level, but he would assume they cracked under torture rather than realize the pain was the actual trigger. The people behind the screen stared at each other, abject fear widening their eyes. Blake recognized the woman's coffee-colored skin, only a shade darker than his own, and her almost-black eyes and long, shiny, dark hair. Had they taken her from a reservation? Or was she like him, one of the lucky ones who had managed to escape the poverty and build a new life? She strained against her bonds. "Who are you? Why are you doing this to us?" Dumas leaned forward once more. "I don't believe you're in any position to be asking questions, Ms. Lowery. The chair you are strapped to has an electrical current of over a thousand volts attached to its feet. If you don't do as I ask, I will make sure my people start applying that voltage. We'll start off low, but it won't stay that way for long if you don't comply." "You can't do this!" she cried. "This is abduction, and you're threatening torture! It's against the law." He leaned forward. "We're outside of the law, Ms. Lowery. Now, I suggest you do as I tell you and change before I get my men to switch on the current." Dumas turned to the other men and caught Blake's eye. "She's feisty." He nodded approvingly. "I like that." "What the hell do you people want?" the man yelled, but no one acknowledged him. Blake knew his background: married for eight years, two children-a boy and a girl-your average American Joe. With the exception of being able to shift into the form of his animal spirit guide. For now, Dumas' attention seemed to be focused on the boy and the woman. Blake didn't doubt the man's time would come. Dumas turned back. "Do you see the boy sitting in the chamber beside you? How about if he's the one who receives the charge? Do you know what a high electrical current does to the human body, Ms. Lowery? Oh, but wait. You're not exactly human, are you?" He laughed. "Why keep denying it?" Blake clenched his teeth. Dumas was wrong. Spirit shifters were human, at least most of the time. They just had talents unlike the vast majority of their counterparts. Their abilities varied from shifter to shifter. Where some people, like himself, had been chosen by their animal spirits at birth and so could shift at will, the majority were chosen by their spirits later in life, making their powers less. "Do you know what happens to the body during an electrocution?" Dumas continued. "Your heart will stop; whether that's permanent or simply an arrhythmia, depends on the voltage. Every muscle in your body will go rigid. You will probably bite down on your tongue, possibly severing it. Oh, and because you're not completely strapped down, there is a good chance an arch of electricity will leap from the chair to your body, causing severe burns. Is that what you want to happen to the boy?" Her gaze darted wildly to the teenager in the room beside her. The boy renewed his struggles, the muscles in his arms popping as he tried to wrench them from the cuffs. "I can't do what you want me to!" she cried. "It doesn't work like that!" A sly smile quirked Dumas' lips. "So you admit there is something you can do?" Tears welled in her dark eyes. She looked between the boy on one side of her and the man on the other. The man's jaw tensed and he gave his head a slight shake. Blake took a deep breath, trying to disguise his reactions to the scene playing out in front of him, allowing the air to exhale slowly through his nose. He wanted nothing more than to leap at Dumas and rip him from the control panel and set the other shifters free, but he couldn't. This thing was bigger than three people. He'd need to find a way to release them, but he'd need to do it later, when he could disguise his identity. Being in the middle of this thing allowed him to learn of the government's plans, even if it was simply by eavesdropping on conversations. Haverly was also privy to most of the secret conversations, but not all of them. Blake was used as muscle for whatever Dumas wanted, and the man tended to keep him around. Learning more about the progress of Operation Pursuit was the most important thing. At times like this, he needed to remember that. Dumas' head cocked to one side. "Time's up." He gave a nod to the man sitting beside him, a technical guy Blake only knew as Miller. The man returned the nod and flicked a switch. The boy went rigid in his chair, his fingers curling, his knuckles turning white from the pressure of his grip on the arms of the chair. The shock was small and he fell limp after only a couple of seconds, but he groaned, his head lolling forward. The woman stared at the boy in alarm and then back at the two-inch-thick glass. Due to the one-way mirrors positioned on her side, she was unable to see her captors. "What the hell do you think you're doing?" "Are you going to do what we want?" "I can't! How many times do I have to tell you?" "Then we'll increase the voltage." Dumas gave Miller another nod and the man twisted a dial on the console and flicked the switch once more. Instantly, the boy bucked in the chair, his back arching, his narrow chest thrusting out. His eyes rolled in his head, flashing the forked red of his eyeballs. He jerked, his hands once again tightening around the arms of the chair as a higher voltage of electricity shot through his young body. "No! Stop!" the woman screamed. "You're hurting him." The man said nothing, but resumed his efforts to get free. Miller flicked the switch and the current died, the boy dropping limp in his chair. Blake's heart lodged in his throat. Was the boy dead? No, his eyes flickered open and he started to groan. Dumas pushed the button for the microphone. "That was nothing. We can go a lot higher." She pounded her fists against the metal armrest of her chair. "I can't do it at will! Why won't you listen to me?" She paused, her eyes widening. "Electrocute me! If you electrocute me, I might be able to change for you. I'll try, honest I will." Blake didn't want to see either of them electrocuted, but the woman might be stronger. The boy would have turned by now if he had the power to do so. Blake could only assume the reason he hadn't was because his connection with his spirit was weak, and possibly the electric current had done nothing to help. Either that or he was strong enough to resist. But Dumas shook his head. "I'm the one who makes the decisions around here. I don't do bargaining. Especially not with a bunch of freaks." "Perhaps her idea is a good one." The three men sitting at the control panel turned at Blake's voice. Dumas appraised him with his cool, blue eyes. "And why would you say that?" "Let her feel what the boy is suffering. Maybe if she experiences the sort of pain he's in, it'll help her make her decision." Dumas narrowed his eyes and opened his mouth to speak, but Haverly interrupted. "I think Sergeant Wolfcollar might be onto something. We need to change things up a bit." Dumas looked between the two men and gave a slow nod. "Very well." He turned to the man controlling the current. "A thousand volts to the woman." Miller nodded and pushed his wire rim glasses higher on his nose. He reached out and switched on the electricity. The brunette went rigid, her eyes wide. She juddered in the chair as the volts raced through her body. Her fingers curled, her knuckles white, her eyes bulging from her head. Dumas gave the nod and the other man flicked the switch back again. The electricity stopped and she fell forward, slumped in the chair. Her whole body heaved as she breathed in deep gasps, her hair falling over her face. As they watched, the muscles in her back rippled beneath her t-shirt. Her slender biceps bulged, swelling against the material of her clothes. She lifted her face to them, her dark eyes wide. "It's happening! You need to let me out of these cuffs." She yanked on the shackles on both her wrists and ankles. Blake caught sight of painful red burn marks beneath the metal. He wanted to look away, but duty kept his eyes focused. He was playing a part in this and needed to see it through. His involvement was for the best in the long run. Dumas laughed. "I think not." With his stomach sinking, Blake realized what was about to happen. "You need to undo the cuffs. They're too small for her." Dumas spun around. "They fit perfectly. And what is it to you?" "They won't be in a minute." The woman lifted her head and screamed. The sound of bones cracking ricocheted around the small room. She dropped her head again, panting. Miller's eyes widened behind his glasses, his already pallid face paling further, and he leaned back in his chair. "What the hell?" This must be his first time witnessing a shift, Blake realized. He wondered if the tech guy would return for a second viewing. Her hair seemed to shrivel away, as though a flame had been applied to it, revealing the shape of two ears curling from the top of her head. She lifted her face again, her dark eyes now flashing yellow, but her features were no longer those of an attractive woman. Her canines were white in her elongated jaw, her skin covered in thick, black hair. Her bones cracked, her fingers curling in to create paws, claws piercing through the skin of the second knuckle of her fingers. More short black hair sprouted from the backs of her hands. The thickness of her forearms grew, and Blake looked on in horror, knowing exactly what was going to happen. The metal rings didn't give with the growth. Instead, her skin, bones, and flesh gave way beneath the restraints, snapping what had previously been her wrists but were now her front legs. She twisted in her shackles, growling and hissing in agony. Under the cuffs, each limb had been crushed and now hung at painful angles. Though Blake knew she would heal-and heal quickly, it was part of the make-up of their kind-if they didn't get her out of the cuffs right away, her joints would heal at those awkward angles and they would need to be broken again to heal straight. The team looked on as the bleeding, snarling, still-cuffed black panther twisted in agony behind the glass.